(APN) ATLANTA — State. Sen. Jason Carter (D-Decatur) is currently running for the Democratic nomination for Governor of Georgia, and is hoping to challenge Gov. Nathan Deal or another Republican nominee in the General Election this November. 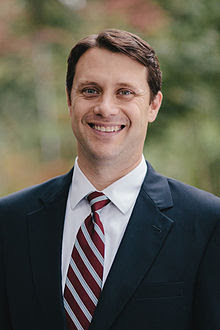 Sen. Carter was elected to the Georgia Senate in the 42nd district by Special Election on May 11, 2010 and reelected to the Senate in 2012. He is the grandson of former President of the United States Jimmy Carter. He served in the Peace Corps stationed in South Africa. He is married to Kate and they have two children, Henry and Thomas. He graduated from Duke University and earned a law degree at the University of Georgia School of Law. He is a lawyer at the law firm of Bondurant, Mixons & Elmore in Atlanta, Georgia. I’m not opposed to nuclear power. I am opposed to cost overruns being passed on to consumers. I have fought the power company on those issues before. What is your plan, if any, to increase solar and wind energy in Georgia? We have to spend time and resources developing those alternatives energies. I’ve sponsored bipartisan legislation to make it easier for people to finance solar installations. We need to free up the private sector to do that because right now they are not free to do it. I have spent a lot of time with the solar industry folks and with advocates promoting solar energy. I am a strong supporter of those alternative energies. Would you support genetically modified foods (GMO) labeling in Georgia ? I would have to look at the pros and cons. I am not opposed to the concept and would have to look at what the impact would be. Do you support a voter verified paper audit trail in electronic voting? I would rather see a paper trail. I have personally monitored elections in other countries. One of the most important aspect and credibility of those elections is a verifiable paper trail that people can look at and see that their votes have been counted. In order to achieve it, we have to figure out how much it costs. We have to do all the things that are required to make a real policy out of it. As a concept, I wish we had a paper trail. I would certainly call for it. I think it’s important for credibility of that system. People need to know that their votes are counted. Do you support medical marijuana in Georgia including the implementation of Georgia’s existing medical marijuana research law? I tend to be a Libertarian on issues like this. I do think it would have to be a carefully crafted piece of legislation with respect to medical marijuana to ensure that there are no unforeseen consequences. As a general matter, if we can structure something that we think is viable, I would have no problem with it. With respect to the research, I would need to know more. My assumption is that there has been a giant amount of research done already, since the eighties, and I would want to know what the costs and benefits would be toward funding additional research. One of the things you will find about me as an elected official, and hopefully as Governor, I will listen to facts and will look at data and will make decisions based on that and not based on rigid ideology. How will you balance the budget in your proposed budget to the General Assembly? Do you support cuts or increased revenue? We are going to balance the budget no matter what. My biggest budget proposal that I think is the most important thing we can do for our state is to change the way we budget for education. Right now, we have a complete shell game. We say education is important but then we cut the same way we do everything else. I think that if we bifurcate the budget and have an education budget that is separate and the rest of the General Funds does everything else, then the politicians in Atlanta will be forced to vote yes or no; that this is the education system that we want to provide for our state. If we do that, you will enforce education as the top priority of the state. Then you have to balance the budget on everything else. I don’t think you can ask the people of Georgia to pay more from a revenue standpoint given the budget in process that we have now. Would you close some corporate loopholes? One of the biggest problems we have is all these tax giveaways and we don’t know whether any of them are actually helping or not. What we have proposed in the past is legislation that would review all of those tax giveaways and loopholes to ensure that the only ones we would keep are the ones that are actually productive and improve our state and generate jobs. What is your plan for improving public education in Georgia? First we stop the shell game of the budget by separating out the education budget from everything else and force people to vote on whether or not they are providing the education system they want. I believe you will see a change in the way we fund education. At a minimum, money is not the only answer. In my opinion, we have to focus almost exclusively on everything we do through one lens, and that lens is ensuring that we have the best trained, most well supported highest quality teaching workforce you can have. That requires us to recruit and retain the best teachers and treat them well and support them and give them the tools that they need to improve and move forward to develop professionally. Right now, we are not doing that and we have a serious morale problem in the teaching workforce and a lot of small indignities that go along with being a public school teacher that should not be there. My wife teaches at Grady High School and those little slights weigh on her and weigh on me. That is very personal to me and I think we have to focus on. What is your position on Charter Schools? I think charter schools are a tool that can be used to support the public school system, but they have to be part and parcel of that public school system. The way charter school can be helpful is, if they allow themselves to be laboratories for innovation and finding best practices. That has to be done with an eye toward improving and providing a good school for every kid not just kids that are in charter schools. I represent some of the best charter schools in the state. Anybody that looks at Drew Charter School, for example, will see a school who is doing exactly what we want schools to do from a student standpoint. What is your plan to increase jobs and grow the economy in Georgia? The most important thing we can do in Georgia with respect to having a healthy economy is to ensure that our education system is viable and is educating people to have the skills they need. The biggest anchor we have on economic growth, right now, is our education system. The Governor’s policies with respect to technical schools, higher education, K through 12, have all undermined our ability to grow toward the future. The other piece that is important to me is technical schools. We have lost forty five thousand students in our technical schools because of the Governor’s policies. That is an economic disaster waiting to happen. We’ve got employers that need folks with skills and we’ve got people who want to move up in the world and need those skills and they are not able to go to technical schools, and that’s not good for anybody. In addition to that, one of the problems we have is that, if you have a direct line to the Governor’s office as a business, you get a lot of good treatment. If you are a regular small business or a middle class family, you don’t get that same treatment. What we want to do is to help promote small business in Georgia to help folks that are moving into the middle class and moving from the middle class up. We want everyone to be as prosperous as they can be but we’ve got to do that with the small businesses and not just the giant companies. There is a variety of ways to do that [with small businesses], one is entrepreneurial education and innovation. We have a reputational wall around our state when it comes to risk capital. So we don’t get the kind of investment in our small businesses that we could if we expanded and promoted ourselves and put a new forward-looking face on our state that would reduce some of that reputational wall with respect to risk capital. Number two, I would support job creating tax credits for small business. We give all these tax credits that are industry specific and we need to review those. If we allow small business to receive the same kind of treatment from the Governor that big businesses get, we will see a lot more job growth. At the end of the day, I want an economy and a community that is inclusive and works for everybody and ensures that everybody has an opportunity to be prosperous and be productive people. We may not agree on all things but I am somebody who will listen and make decisions based on facts as I see them.